Tired of facing the same old kobolds? 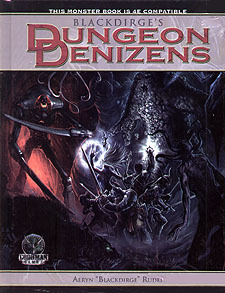 Blackdirge's Dungeon Denizens takes the very best original monsters from the pages of over 55 Dungeon Crawl Classics adventures, converts them to 4th edition, and compiles them in one volume. Here you'll find more than 100 unique monstrous foes from levels 1 to 30, plus a few old classics updated for the fourth edition of the world's most popular fantasy role-playing game.